Marteace Tiffith left behind three sons and two daughters, according to friends. AUBURN GRESHAM — Marteace Tiffith was an inspiring man, his co-workers at University of Illinois-Chicago said. The building engineer also kept them laughing. "He was just a funny and inspiring guy, the kind of guy who always wanted to see everyone smile," Larhonda Woods said. "He always had us laughing, but he also had all this knowledge, and he was always trying to help people out. "I wish we had the chance to tell him how much he helped us and inspired us," she added. "It's the kind of thing you never think about doing until it's too late." 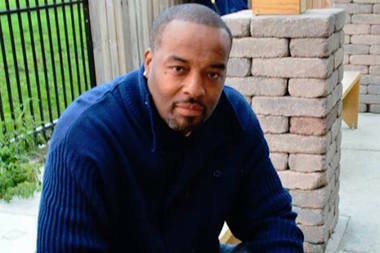 Tiffith, the father of five, was shot outside his Auburn Gresham home by someone in a passing SUV on March 9. He died from his injuries Sunday. Tiffith, 42, was arriving at his home in the 8800 block of South Wood Street when he was hit in the head, arm and shoulder. He was taken to Advocate Christ Medical Center, where he died. Tiffith left behind three sons and two daughters, according to friends. Demitries Melton was sleeping a few houses down when he was jolted awake by "seven or eight shots" that night, he said. When he ran over to Tiffith's house, he saw Tiffith "lying face down" but "breathing and talking." "He was awake, he just kept telling me to call his mama," Melton said. "So I did, and she came screaming down the block, and the ambulance came right after that." Though he saw Tiffith and his kids come and go from the house, Melton said, he didn't know him well. Tiffith had just moved into the house with his mother and sister a few months earlier, Melton said, and another neighbor called them "the most private family on the whole block." Meanwhile, Woods, who worked with Tiffith at UIC, said the staff was devastated by the sudden loss. After the news broke that Tiffith had succumbed to his wounds, dozens of people took to Facebook to share memories and condolences. Catrina Tiffith, Marteace's sister, wrote in a post that the family is planning a "home-going service" for him. Tiffith, meanwhile, had posted on Facebook the day before he was shot. "Remember, there are no mistakes, only lessons," he wrote. "Love yourself, trust your choices, and everything is possible ..."
As of midday Monday, the post had 409 likes.